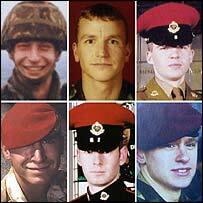 Police are to consider investigating claims of neglect against the Ministry of Defence over the deaths of six Red Caps in Iraq, Scotland Yard has said. Relatives of the men - killed by a mob at a police station in southern Iraq in June 2003 - requested an investigation be carried out. In March an inquest recorded a verdict of unlawful killing on the deaths of the men, who were based in Essex. The MoD said its inquiries ruled out charges and it stood by those findings. "There was a board of inquiry and a RMP investigation but at the end of the day no one was prosecuted," a spokesman said. The bodies of Royal Military Police officers Sgt Simon Hamilton-Jewell, 41, Cpl Russell Aston, 30, Cpl Paul Long, 24, Cpl Simon Miller, 21, L/Cpl Benjamin Hyde, 23, and L/Cpl Thomas Keys, 20 - all from the Goojerat Barracks - were found at the police station in the town of Majar al-Kabir. The inquest also heard of a catalogue of military failures. The six men had been attacked by a mob of hundreds of young Iraqis armed with Kalashnikov assault rifles and rocket-propelled grenades. Thursday's announcement comes after the fathers of three of the men met senior Met police officers in London to demand a criminal investigation into allegations of neglect by the Ministry of Defence over their deaths. In March solicitor John Mackenzie, who represents the families of the men, wrote to Metropolitan Police Commissioner Sir Ian Blair asking for an inquiry. He wrote: "The evidence given to the coroner showed extensive default by military personnel which may well have constituted manslaughter and offences under the Army Act 1955." He asked police to "consider whether there is evidence of any criminal conduct" arising from a failure in procedure and lack of provision of communications equipment. The March inquest into the deaths found the men should have been better equipped but that their deaths could not have been avoided. Oxfordshire coroner Nicholas Gardiner said the men should not have been given antiquated radios and inadequate ammunition and said he would write to Home Secretary John Reid about army equipment and procedures.